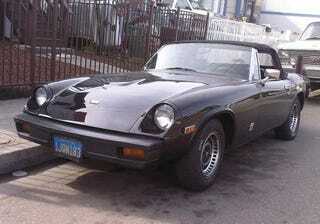 So let's look at a really nice daily-driver Jensen-Healey down on the Alameda street. That's right, you heard right, this Malaise Brit is a daily driver! The owner tells me he's had the car for 20 years, and that the electrical system has always worked fine, right down to the dashboard clock; he acknowledges the miraculousness of this achievement: "They must have been having a good day at the Lucas plant." It's powered by the Lotus 907, aka The Torqueless Wonder. The US-spec version of this engine made 140 horsepower out of 120 cubic inches, which was completely berserk for the Malaise Era (for comparison purposes, you might note that the 350-cube V8 in the '74 Camaro produced just 145 horses).